We offer Half Bag (6oz), Standard Bag (12oz), Double Bag (24oz) and Triple Bag (36oz) options. 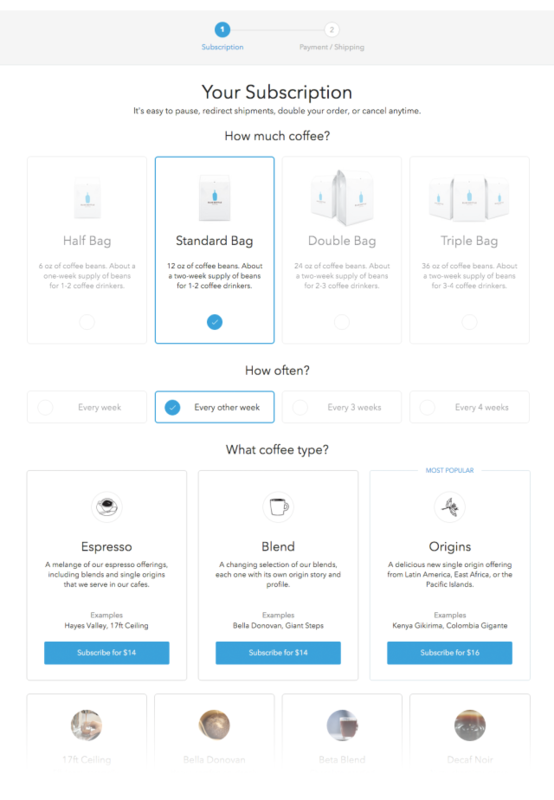 Select how frequently you would like to receive your coffee; whether weekly or monthly, we’ll make sure you are well stocked. Origins brings you a new single origin coffee with every shipment. These coffees tend to be medium to light-roasted, and they vary in sweetness and acidity. Our Espresso subscription is a rotating selection of our espresso blends and the occasional single origin that sings from the grouphead. This one's for espresso devotees and people who love darker, roasty coffees. You can check out our subscription options here using our subscription tool. Feel free to play with the amount and frequency. You’ll see the prices for each subscription change accordingly. You can also sign up for a trial and try out the subscription before you buy. Already have a favorite blend? For those creatures of habit, you can also subscribe to just that coffee. Bella Donovan enthusiasts and Three Africans habitués rejoice!